How to Determine the Power Requirements of a Specific Appliance? Portable generators are great sources of electricity when the main grid power goes down, or when you are outdoor camping or moving around in your RV. With a portable generator, you will be able to power your appliances and charge your devices in all situations. Finding the best portable generator can be a challenge if you don’t have the right information. And we are here to help in your search on finding a suitable generator for your different power needs. With our detailed comparison chart and unbiased portable generator reviews, you’ll learn everything about portable generators, and how to pick the best one for your needs. Our panel tests the generators according to stringent criteria, featuring only the top rated portable generators in the market. We are showing different types of generators as well as heavy duty and low duty comparison lists, so we can cover all your different power needs. With our vital buying guide, we will also explain how to decide on your generator of choice, as well as how to maintain it to stay in top conditions and save your investment. Scroll down to see our exclusive features comparison tables for the best generators for heavy duty and light duty power needs. 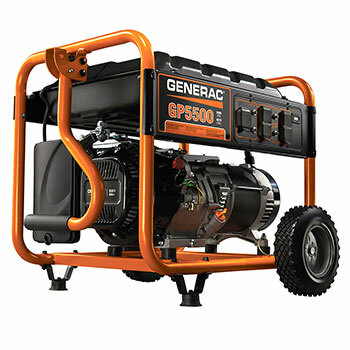 In addition, to our top 10 portable generators list, reviews, and guides. The latest hit model from Westinghouse comes packed with power and ease of use features. 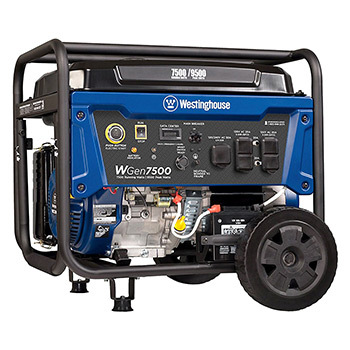 At 7500 running watts and 9000 starting watts, the Westinghouse WGen7500 is the best portable generator and the most powerful in our list. This gas powered generator, designed with durability, and functionality as a focal point. Starting, set up, and maintenance is easy, it’ll pretty much start working straight out the box, requiring minimal assembly. Has a 6.6-gallon gas tank, the WGen7500 is a powerhouse, and proves more than capable of covering your home power needs, even over an extended period of time. Equipped with some useful features, such as; the built-in fuel gauge to easily check the gas level, low oil automatic shut-off, overload protected outlets including twist lock outlet for powering heavy-duty appliances. It’s also EPA, CSA, and CARB approved. Westinghouse, a trusted name in the world of electric products, and has built its reputation quality craftsmanship and excellent service over the years. The WGen7500 is a reliable and powerful generator built with the quality you would expect from this brand. Powerful, heavy-duty engine with a cast iron steel frame that provides additional protection for the whole unit. Starting and running this machine is easy with a manual recoil, electric start, and a remote key start. Fuel efficient with a long run time, more than 10 hours on a single full tank of gas when at half load. Heavy, weighing a bit over 200 pounds. Not easy to store or transport. At 64 decibels, this unit may not be quiet enough for camping trips and simple outdoor tranquility time. A generator needs to have a reliable engine to power the things you want to use safely, and the Honda EU2200I portable generator stands up to the job. New and improved with a stronger engine, 10% more power, quieter operation, and simplified maintenance than the previous model the Honda EU2000i. With no change in weight or cost, weighing under 47 pounds, this little machine carries a lot of power for its size. Producing 2200 watts of surge energy, and 1800 watts of continuous running energy; this portable inverter generator is designed to comfortably handle your portable power needs. And, you can double your power by connecting it to another unit. Not only is it powerful, but it can also charge your delicate electronics, such as laptops, cellphones, and cameras using stable, clean sine wave energy. The EU2200I is very easy to use with its improved recoil starter, pulling with little effort and starting quickly; making this a great power tool to have while camping, as well as an emergency backup power source. Overall, the Honda EU2200I, a highly recommended generator, delivering both power and usability, while still maintaining industry standards of quality and workmanship. CARB compliant and a portable design makes it useful for a variety of professional, and recreational activities. Better overall durability with a more powerful engine, better internal cooling, managed by Honda’s Eco-throttle system, guaranteeing efficient fuel consumption. A super quiet generator, producing only 57 decibels at full load and 48 decibels at quarter load. Has a gas capacity of just under one gallon, runs over 8 hours at quarter load, and runs over 3 hours at full capacity on a single tank. Lacks a fuel gauge making it hard to know the remaining fuel left in the tank. A reliable generator but is a bit on the expensive side. 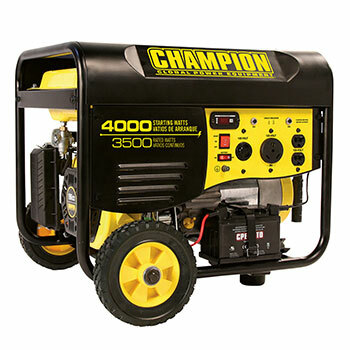 The Champion Power Equipment 46539 is a powerful gas fueled generator with great features. Including a 30 amp RV outlet and a cold weather engine start feature. This generator is rated at 4000 starting watts and 3500 running watts, and runs for 12 hours at 50% load. Capable of starting, and running a 15,000 BTU RV air conditioning system; making it more than capable of handling your trailer, boat, or backup power needs. A handle that can be folded away when not in use, and specially designed to never go flat wheels allow for easy transportation. And the cast iron sleeve on the engine makes this durable portable generator, CARB compliant; producing low emissions. 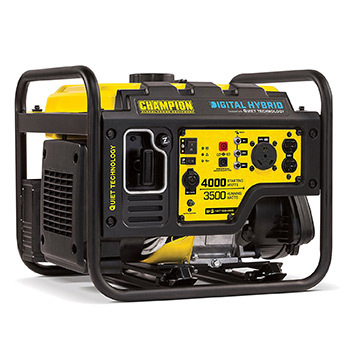 The Champion Power Equipment 46539 portable generator, has all the power you need, combined with user-friendly features. Has a volt guard feature which protects connected appliances in the event of a power surge due to a 20-second power delay. For added protection to the connected appliance, the power also cuts off a few seconds before the engine stops. Featuring IntelliGauge showing hours, hertz, and volts in use. Wireless remote start, you can conveniently run your generator from far away, up to 80 feet. Lacks an appropriate gas drain and due to the position of the dipstick, it may be a bit difficult to make oil changes. It lacks a 240V outlet which may be an issue for some users. The 55 pounds, Briggs & Stratton P2200 produces a steady output of 1700 watts, with a surge output of 2200 watts. Equipped with multiple outlets, this inverter generator is safe to use with sensitive electronic devices; with less than 3% total harmonic distortion. Capable of powering a variety of appliances such as your mobile devices, blender, and TV. The one-gallon gas fuel tank runs this inverter generator for up to 8 hours at 25% load. At only 59 dB when running at 25% load, and at 57 dB in eco mode, it’s very quiet. It features a low-oil and overload alert system, to automatically adjust the engine speed according to the power being used to save fuel, run longer, and quieter performance. Making it a great generator for camping. The H-handle built into this generator makes it easy to pick up and move, even for one person. The Briggs & Stratton 30651, P2200 PowerSmart Series is light-weight yet powerful enough to run multiple appliances at once. Offering a reasonable price tag compared to other models of inverter generators. User-friendly with a convenient control panel for easy operation. Comes with a dedicated parallel port which you can connect a P2200 or a P3000 unit for more power output. May require more than 3 pulls to start while lacking an electric start button feature. Produces too little power to operate certain heavy duty equipment. Rated at 3500W running power and 4000W surge power. A cost-effective digital hybrid portable generator, RV ready with quiet technology. The Champion Power Equipment 100302 digital hybrid is an inverter generator in an open frame design. Features a more efficient mechanical design, comes fully assembled with a durable steel frame. Has a large gas tank of 2.9 gallons that allows it to run for up to 17 hours at quarter load. Rated at 64 dB from 23 feet away. RV ready with enough power to run a 15,000 BTU RV air conditioner. Not to mention with the incorporated inverter technology it’s also suitable for use with sensitive electronic devices. Produces clean power with less than 3% total harmonic distortion. Protected by an automatic voltage regulator, low oil shutdown, and overload protected. Features a convenient control panel to easily access all controls in one area. Has two 120V household outlets, one 120V RV outlet, and a 12V DC outlet. Has a smart economy mode that controls the engine speed according to the applied load. This feature allows for higher fuel economy, extended engine life, and quieter performance. Weighing almost 83 pounds with no wheels for added portability. You can acquire a wheel kit but at an extra cost. Adding fuel might be a challenge. Easy to accidentally splash out gasoline unless you go slow and careful. The WEN 56475 an economical and powerful portable generator. With a full gas tank of 4 gallons, you can run this generator up to 11 hours at half load. Fuel efficiency is an important thing to consider when choosing a portable generator, and this one makes a great example of that. Packing 4750 starting watts, and 3750 running watts. With two 120V household outlets, one 120V/30A prong outlet, and one 120V RV outlet make this generator easy for use with a myriad of devices; able to run your tools and appliances. Weighing 112 pounds, however, with collapsible handles and smooth rolling wheels, it’s easy to transport. Featuring an electric start switch, hour meter, low-oil shutdown, overload protection, automatic voltage regulator, and everything to ensure your machine and connected appliances are all running safely. It’s also CARB compliant, meaning it’s safe to use and operate in all 50 states. With nationwide customer service, the WEN 56475 offers good value while being fuel-efficient, and powerful. A digital readout to help monitor maintenance intervals and oil changes. Has steel frame enclosure and an internal air-cooling system to keep the engine cool, maximizing durability and engine longevity. At 67 decibels, it may sound like a vacuum cleaner when placed nearby. Poor quality control during manufacturing. This gas-powered generator produces 5500 watts of consistent power and 6875 watts starting power. The Generac 5939 has a 6.7-gallon gas fuel tank and runs up to 10 hours on a single tank of gas when used at half capacity. The OHV engine uses splash lubrication to aid in a longer life of the entire generator. Runs high power appliances and ready for rugged working conditions, able to power your freezer, heater, and window air conditioner. And with its covered outlets protecting it from the environment, you can use it safely outdoors in extreme weather conditions. The low oil level shutdown feature prevents engine damage in case your generator runs out of oil, and it has an incorporated hour meter and a fuel gauge that makes knowing how much fuel you have left a breeze. The fold-able handle and special never go flat wheels allow for easy transportation. That’s an important feature for a portable generator that weighs 180 pounds, but they require some assembly out of the box. A powerful engine capable of powering heavy duty equipment. Durable enclosure, made of steel. It also has a steel-tube frame that adds durability, and strength to the whole unit. Changing the spark plugs is a challenge as you would have to remove the fuel tank in order to reach it. 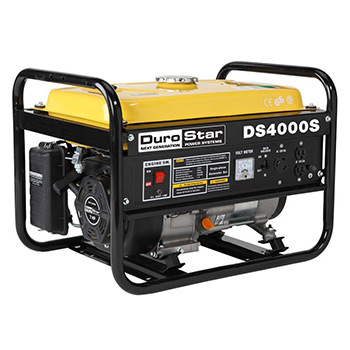 4000 starting watts and 3300 running watts, the DuroStar DS4000S, is a rugged power machine. Ideal for a variety of uses, from running your power tools in your remote project to getting you through a power outage. The heavy-duty steel frame eliminates rattle, allowing for quieter operation. Rated at 69 dB at quarter load, this portable generator is relatively quiet for its size. Equipped with a full power panel; easy to use recoil start, complete with warning light indicators, circuit breaker, voltmeter, and power outlets. Its 4-gallon gas tank allows it to run for 8 hours at half load. And the gas gauge is easy to read, allowing you to check the gas level at all times. It has a low oil shut-off feature which prevents damage to the 7 horsepower air-cooled engine if you run low on oil. Overall, the DuroStar DS4000S is affordable yet works efficiently, and has a variety of uses. Offers a great value for its size compared to other generators. Doesn’t come equipped with wheels, while weighing 94 pounds; which is rather inconvenient for a portable generator, but it does have an optional wheel kit that you can purchase separately. Fuel consumption is high and requires frequent oil changes. A 7 horsepower engine, this gas-powered generator has a starting output of 4400 watts, and a continuous output of 3500 watts. 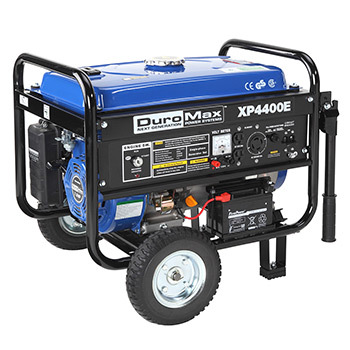 The DuroMax XP4400E is a good option for outdoor projects for powering your tools, and equipment. At 50 percent load, you can run this generator for up to 8 hours on a single full tank of four gallons. The steel frame built around the XP4400E eliminates rattle allowing for quieter operation, rated at 69 dB at quarter load. Comes with a standard recoil start as well as an easy start electric key option. Overload protected outlets to safely charge your batteries and devices. Low-oil protection system, advanced automatic voltage regulator, and the voltmeter and battery charge indicator light; are all great features this generator is carrying. Multiple outlets, including a twist lock for tools requiring a high-powered outlet. The DuroMax XP4400E is equipped with wheels and a collapsible handle for easy transportation, but some assembly is required. Powerful with a steel frame heavy-duty design and comes at a great value. Hard to drain the oil and the tools included in the box are insufficient. At just 36 pounds, the PowerPro 56101 gas powered portable generator is as portable as generators can get. A compact, and easy to use design, making it ideal for light camping use. Rated at 1000 watts starting power and 900 watts continuous power and can run for 5 hours on its one gallon of gas tank at half load. It’s also CARB compliant and has a spark arrestor that makes it safe to use in public areas as national parks and camping sites. Featuring a voltmeter, two power outlets on the side, a three-pronged AC power outlet and a two-pronged DC power outlet each with its reset buttons close by. It can effectively power a wide range of small appliances that do not consume a lot of power such as a fan and a portable lamp. You can, however, not use it with heavy-duty equipment such as power tools. Making it a good option for tailgating, and camping. After all, the PowerPro 56101 is a reliable and economical generator that could be of great benefit for any camper. Affordable and comes in a compact design, makes carrying and storing an easy task. Weak recoil components and handle, made of poor plastic that can easily break. It idles very rough and can be fairly loud. Engine Displacement (cc): 420 cc. 196 cc. 224 cc. 223 cc. 389 cc. Engine Displacement (cc): 121 cc. 111 cc. 208 cc. 200 cc. 72 cc. How, and where you intend to use your portable generator determines the power rating of the generator that you should get. The power requirement in a home is different to the power requirements in a camping day or on a construction site, and for each of these situations, you will need generators of different ratings. The amount of power that you need is influenced primarily by the items that you intend to power up. Appliances are usually rated in their starting, and running wattage. 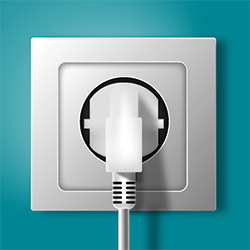 Starting watts are the amount of power required to start-up an appliance, and power consumption is usually highest at this point. The running watts are the amount of power needed to run the appliance continuously. The starting wattage rating is several times larger than the running wattage, and this may mislead you on the amount of power that you require from your portable generator. As you estimate the amount of power that you will need, factor in all the applications that you intend to power up and pick a generator that is rated slightly higher than that figure. The extra allowance caters for additional power needs that may arise in the future. Whisper talking – 30 dB. Operating refrigerator – 50 dB. Vacuum cleaner – 70 dB. Professional generators for factories are a little bit louder because of their high power rating. Professionals using these machines are advised to wear the right protective gear, to safeguard their health and well-being. Here you can learn more about how to use a generator safely. Efficient fuel consumption is a feature of a good portable generator. Such generators, adjust the rate at which they consume fuel with the applied load. With this setting, the engine runs in full-throttle only when the applied load equals the generator’s maximum rating. Such as Honda generators that use an Eco-Throttle feature, that ensures that the engine consumes fuel, efficiently in line with the applied load. Efficient fuel consumption helps you to save money on fuel expenditure. Generators usually indicate their run time at either quarter (25%), or half (50%) of the load. This represents how long it will run on a full tank of fuel at the set percentage of its total power. If you intend to use the generator for emergencies, and you cannot estimate how long the main power supply will be out, then you should get a generator with a large fuel tank. The best-rated generator that you can pick is easy to use and features automatic control options that protect the generator from damage. Low-oil shutdown feature which turns the engine off when the level of oil gets too low. A fuel gauge to easily check the remaining run time. An electric start is another of such features; with an electric ignition, you simply push a button to start the engine. The pull cord method of starting generators is outdated and tiring. However, a good generator has a pull cord as a backup starting option. The weight of a generator is not necessarily tied to the amount of power it generates, but high power generators are usually a bit heavier. The presence of wheels and handles makes it easy to move these engines around. Professional generators are a bit heavier since they pack up more components, and a larger fuel tank to be able to generate all that power that you need for your various power tools and equipment. A generator with several outlets allows you to optimally use your generator by spreading its load. However, using all the outlets on your generator is not advisable as it strains the generator, and this puts its longevity in jeopardy. We recommend using all the outlets only in emergency situations, or when the appliances that you are using are low-wattage. Generators that run on fossil fuels are the biggest culprits when it comes to emissions. This includes diesel and gasoline generators. If you are looking for a ‘green’ generator then a solar generator or those that run on propane may be ideal for you. Also, look for the exhaust certificates that the generator could obtain, such as EPA, CSA, or CARB. The amount of power it generates. The ease of use features it has. Generators from established brands such as Honda and Yamaha are somehow pricey, but for a good reason. These manufacturers are experienced in making these engines, and you can be sure that their generators are reliable enough to serve you for a very long time. Generators are pricey machines, that could set you back a couple of thousands of dollars if they get damaged. It is for this reason that you should only buy a generator that is backed by a long-term warranty from the manufacturer. This way, you can have your generator repaired, or replaced in the event of a failure. A long warranty also shows the manufacturer’s trust in their product. A good warranty is two, or three years long. Read the warranty information carefully to know what is covered, and what isn’t. And, keep in mind to never accept damaged goods. Check out the top 10 list of the most useful portable generator accessories. An emergency source of power for your home or business establishment. For recreational activities as a primary source of power for tailgating, camping, and RVing. To power up tools in a job, farm, or a construction site. The amount of power that you need in each of these situations depends on various factors. Such as, the equipment, tools, and appliances that you intend to power up with the portable generator. Here is how to decide on the amount of power that you require in each of these situations. The amount of power that you need in your home depends on the electric appliances and systems that you have installed. You also need to decide which appliances will be running simultaneously in case of a power outage. This will help you determine the size of the portable generator that you should get for your home emergency needs. If you are using a pump to draw water from a well for home use, and you’d still want to operate it when the main grid power fails, then you will require a powerful generator that is capable of running the pump and other appliances. A well pump may require more than 3800W of power for successful operation. You, therefore, require a generator rated 5000W and above to be able to use the pump, and power other appliances in your home. A small furnace that consumes about 3000W of power. A pressure washing machine rated at 3600W. Electric heaters rated at 4500W and above. An electric clothes dryer rated at 5400W. Portable emergency generators come in different power ratings, with the most common in the range of 3000 – 5000 watts. With this amount of power, you can simultaneously run several appliances such as your AC, TV, and kitchen appliances. Thanks to portable generators, campers, and RVers alike enjoy similar power supply benefits to those who are connected to the grid; such as being able to use their mobile devices to remain in touch with friends, and family. They are able to use various kitchen appliances to prepare meals and to cool down the place with an air conditioner. Items that most campers take with them to camp include a digital camera, coffee pot, and a set of lights. They will also need to charge their phones, and maybe laptops. For a small camping trip, you will probably need to power the lights and charge your phone and laptop. In this case, a small generator rated 1000W or less will do. Heavy campers, with a lot of equipment that require a heavier power supply, would require a generator with a higher power rating in the region of 1000W – 2000W. As you camp, you will, therefore, require power in the range of 1000 – 2000 watts. A portable generator also comes in handy when powering up the different appliances in your motor-home. The appliances that you have in your RV consume a lot of power than those that you will find with an average camper. This is due to the presence of heavy-duty appliances such as an air conditioner, a fridge, and other kitchen appliances such as a microwave, and an electric kettle. The AC, which ranks as the highest power consuming appliance in most RVs, can run on 2000W of power but requires about 3000W to start-up. To power up all these appliances you will require a portable generator rated at 3500 watts and above. If you have a larger AC, the best option would be to connect two smaller generators than using one large generator. It’s easier to move two small generators than it is to move a large one. You can learn more about some of the most important efficient items for an RV here. Construction and other power tools require a lot of power to be able to function properly. A typical 10 inch saw, for example, requires 4500W starting power, and eventually stabilizes at 1800W running power. The running power increases as you increase the load (cutting through thick timber). You, therefore, require a powerful generator to keep the saw running as well as other power tools such as drills, and grinders. To effectively meet the power requirements at a job site, you will need a generator rated at 7500 watts and above. The product stamp at the bottom of the appliance. The data tag found on motors. Most appliances run on 120 volts. There are those that run on 240 volts, and those that can run on either of these voltages. This simple multiplication will help you to figure out the power rating in watts of an appliance. Still, have some questions? Read some of the frequently asked questions here. Gas-powered generators are the most common type of generators around. They run on gasoline which is relatively cheaper than other types of fuel. 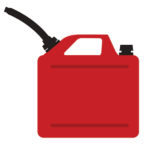 Gasoline is readily available as well, this makes owning a gas-powered generator very convenient. They are safe to use, and they come in smaller sizes, and models making them very portable. They are, however, not environmentally friendly as they usually produce high emissions when in operation. 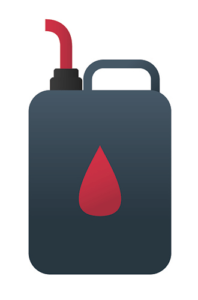 Gasoline has a shorter lifespan of less than a year and, therefore, storage becomes a challenge. Gasoline generators are not ideal for use in colder environments as they do not start well in such weather. You can also learn more about carbon monoxide poisoning here. Of all the fuels that can be used on a generator, diesel is the least flammable. Diesel is just as available as gasoline, and this makes for added convenience. These generators are among the most fuel-efficient generators around. They are powerful machines that last longer under rigorous use, provided they are maintained properly. They generate a lot of power, and if you have some heavy-duty tools to power up, then you are better off with a diesel generator. Diesel has a shelf life of about 24 months, much more than that of gasoline. They are easy to maintain, but when it comes to pricing, they are slightly expensive than gas-powered generators. The emissions of such engines are also prohibitively high, and it is advisable to limit the amount of time you run these generators in a day for environmental protection. Propane generators are clean-running engines that run a bit quieter than other types of generators. They are fuel-efficient machines that ensure economy in fuel consumption. Propane is readily available, and it boasts a better shelf life than diesel or gasoline fuels. They are quite affordable when compared to diesel, and gas generators. They are durable machines as well, that can serve you for a long time. Propane generators are ideal for small appliances, or as a backup power option in the event of a power outage. They are not ideal for large power operations as the logistics required to install, and store them are quite prohibitive. 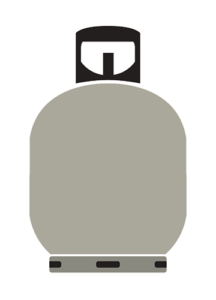 Propane is highly flammable, and potentially explosive since it is usually kept under high pressure. The fuel systems of these generators are very complex and, therefore, they are subject to frequent failures. Dual fuel generators are also available, where the engine has the ability to burn more than one fuel type. Solar generators trap the sun’s energy using solar panels, convert it into electrical energy, and store it in a battery bank for later use. They produce clean free energy, and the fact that solar energy is a renewable resource means that you will hardly run out of ‘juice’ for your generator. Solar generators have no moving parts, and this makes maintaining them very easy. They can be used outdoor as well as indoor areas since they have no fumes or emissions. The amount of power produced by solar generators is relatively low when compared to other types of generators. They are not ideal for powering up heavy-duty, or large appliances; unless you have a big area available to mount a lot of solar panels in it. 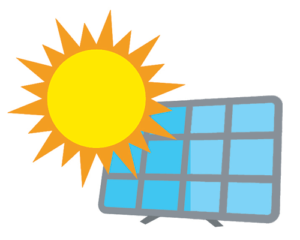 To learn more about solar energy, check our article about the milestones of solar power. Conventional generators are usually characterized by power surges that are particularly harmful to sensitive electronics. Inverter generators, on the other hand, incorporate built-in inverters, that convert the direct current into a smooth sine wave power by limiting their total harmonic distortion; making them safe to use with delicate appliances and electronics. When the main power supply goes off, a lot can go wrong. Your house may heat up beyond habitable levels, fresh supplies in your freezer may go bad, and you are left disconnected from the rest of the world when your smartphone goes off as a result of no charge. With a whole house generator, you will be able to power up your entire home and your critical appliances such as the AC, the refrigerator, the lights, and charge your mobile devices. If you intend to use a portable generator as permanent backup power for your home, we advise having a transfer switch installed by the electrical panel for an effective changeover in the event of a power outage, and upon resumption of the main supply. Businesses that might be harmed when there is no power for a couple of hours would greatly benefit from having a portable generator for their businesses. Such businesses include those that offer Internet-based services to their clients. Or those that require their workforce to file their task reports online, such as insurance firms and banks. 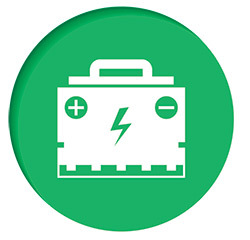 Small businesses such as restaurants, markets, farms, and butcher shops that rely on a refrigerator to keep their stock fresh would benefit from a portable generator to power up the freezer when there is a power outage. In addition to food trucks or mobile shops that would require a portable outdoor power source. Those who live in severe climates can benefit greatly from portable generators. Power failures in extremely cold areas can be very fatal. But with a portable generator, you will be able to power your heater or keep the electric furnace running. If you live in the coastal areas where tornadoes and hurricanes are a common occurrence. Power outages as a result of damaged power lines can put you in the dark for a very long time. Owning a portable generator allows you to power up your home, and live as comfortably as you would with the mains supply. 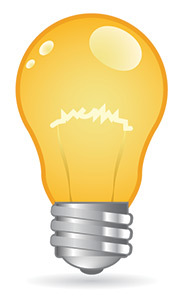 Learn more about power outage preparedness here. A portable generator provides power as you camp or in your motor-home. You are, therefore, able to enjoy the convenience of your home at your campsite or in your RV. You will be able to make coffee, cool the place down with an AC, and charge your electronic gadgets. Builders at a construction site often require electricity to power up construction tools and equipment, such as drills and power saws. These tools make work at the construction site easier, and the builders are able to cover a lot in a short period of time. A portable generator allows the professionals to power their tools as well as light up the place, and this way they can work through the night. Portable generators are helpful in different circumstances to ensure adequate power supply in your home, outdoor activities, or your business premises. With our comprehensive guide and analysis, finding the best portable generator for home use, for recreational activities or even for a job-site should be an easy task. Our portable generator reviews feature only the best portable generators from the best generator brands. We’ve analyzed the features and benefits of each of these models. We have explained in detail what you should look for when choosing a suitable portable generator. By now you should be well equipped with all the information that you require to pick the portable generator that is perfect for your specific needs.